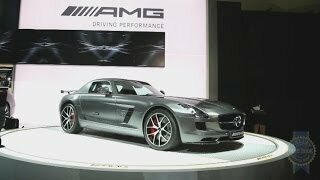 Mercedes-Benz has unveiled the 2014 SLS AMG GT Final Edition, an impressive era coming to an end in exclusive style, at the Los Angeles Auto Show. Final Edition model will be built in a limited series of 350 units. The market launch will begin in March 2014. The super sports car will be available as either a Coupé or a Roadster. 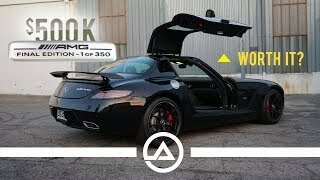 The special design of the Final Edition ensures that it stands out in visual terms: the carbon fibre-effect bonnet with central air outlet, the carbon-fibre front splitter on the front apron, the fixed carbon-fibre rear aerofoil and the exclusive AMG forged light-alloy wheels make it a real head-turner. The AMG forged wheels in a cross-spoke design are available in two colour variants: painted matt black with a high-sheen finish or painted matt black with a high-sheen rim flange. On the interior the high-quality ambience is characterised above all by the striking designo Exclusive leather in a diamond pattern and silver stitching contrasting with the black leather upholstery. Carbon-fibre trim comes as standard. A particularly exclusive detail is the "AMG Final Edition - 1 of 350" badge on the carbon-fibre centre console. The sports seats feature an embossed AMG emblem in the head restraints. 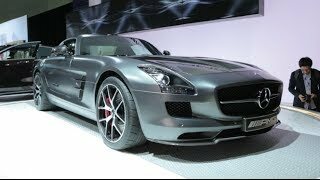 The 2014 Mercedes SLS AMG GT Final Edition will be powered by the AMG V8 6.3-liter front-mid engine delivering 591 HP (435 kW) at 6,800 rpm and 650 Nm (479 lb-ft) at 4,750 rpm. The super sports car will need only 3.7 seconds to reach 62 mph (100 km/h) and 11.2 seconds until 124 mph (200 km/h), while the top speed will be electronically-limited to 199 mph (320 km/h). The pricing for Germany (VAT included) starts at 225,505 euros for the coupe and 233,835 euros for the roadster.